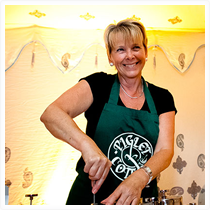 When it comes to Hog Roasts, Piglet Cottage provides a complete service. 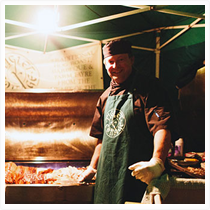 We arrive on site with all the equipment necessary to produce a perfectly cooked pig and have a fantastic Hog Roast. 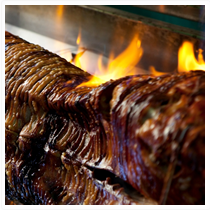 The skin is scored to ensure plenty of crispy crackling and the cooked meat is freshly carved and served with the accompaniments you have chosen. The delicious Porchetta with rosemary, thyme, sage, fennel, garlic, olive oil, sea salt, black pepper and honey. With rosemary, garlic, sea salt and black pepper all flamed in calvados. Why not create your own style? Or….why not opt for a delicious succulent lamb roast. These can generally feed up to 45 guests. Once again our lamb is locally sourced and is basted in olive oil, fresh lemon juice, rosemary and thyme and is slowly cooked for that truly delicious taste of the west…you may want to create your own taste. Vegetarian options can also be provided by special request.